Interspecific trade-offs in foraging strategies can facilitate species coexistence in diverse communities with overlapping resource use, especially in taxa with complex social-foraging strategies. 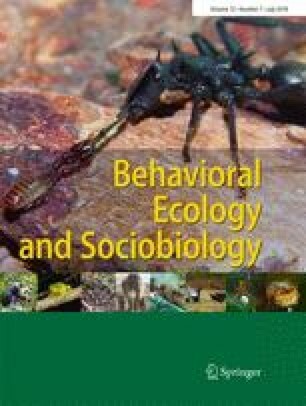 The discovery-dominance trade-off hypothesis is often invoked to help explain coexistence of ant species that use overlapping food resources, wherein colonies of some species are better at collectively discovering new food, while others have superior social fighting abilities to subsequently assert dominance over a resource. This hypothesis has yet to be tested in diverse arboreal ant communities. We assessed the competitive outcomes of arboreal ants at new food resources and further asked if the number of ants present and their body size influenced the observed outcomes. We did not find support for a discovery-dominance trade-off. Instead, we identified a discovery-defense strategy, wherein the first species to collectively forage at a new food resource usually defended it successfully from other species. This suggests that the discovery phase is the most important for determining the outcome of competition over food in arboreal ants. This importance was further supported by the insight that the number of ants present largely determined the access of species to food resources, not individual body size. Broadly, our results suggest that although arboreal ants rely on similar food resources, coexistence may be mediated in part by the prevalence of the discovery-defense strategy: most species have the capacity to be the first to discover newly available food resources within the complex canopy, and discovery is coupled with the ability to defend a new food resource long enough to benefit from it. The discovery-dominance hypothesis is one of the most studied trade-offs in research on foraging interactions and coexistence in ant communities. Since most ant species have a relatively similar diet, species may differ in their ability to either be the first to discover food, or subsequently dominate food via better fighting abilities. However, instead of the discovery-dominance trade-off, we identified support for a widespread discovery-defense strategy in arboreal ant communities. In this discovery-defense strategy, the first species to collectively forage at a new resource is also typically the one to keep control of it. Moreover, we also found that the most important trait for arboreal ants in determining their success at a food resource was the number of ants present, which emphasizes the importance of the discovery phase in interspecific competitive outcomes. The authors would like to thank M. Gonzaga, R. Feitosa, R. Pacheco, S. Sendoya, and two anonymous reviewers for valuable comments on prior versions of this manuscript. This study was funded by research grants from the Brazilian Council of Research and Scientific Development, the Brazilian Ministry for Education (MEC/CAPES), and the National Science Foundation (Awards DEB 0842144, and DEB 1442256).